Acoustic vortices are helical waves able to induce streaming in closed cavities and to manipulate tiny, fragile or sticky objects without direct contact. They are currently generated by an array of transducers with a circular phase shift. Nevertheless, this method puts a lower bound to the object size. Our research team « Acoustique pour les nanosciences » in association with the « Aiman-Films » group at IEMN (Lille) managed to solve the problem by defining and synthesizing for the first time a family of swirling surface acoustic waves. In a holographic fashion, these waves radiate in any nearby liquid and form acoustic vortices. Since ultra-short wavelength surface waves can be conveniently generated, this work paves the way for a dramatic shrinking of acoustic vortex transducer size. In order to synthesize an acoustic vortex (figure 1), we should only need to create its cross-section. It turns out it is not that easy ! Contrasting with liquids, acoustic waves in crystals do not propagate at the same speed in each direction. Consequently, current acoustic vortices could not propagate on piezoelectric crystals. The researchers managed to generalize these vortices to anisotropic media and to compute their cross-section. Acoustic vortex and swirling surface acoustic wave. The surface wave is a cross-section of the acoustic vortex, it generates a complete vortex when it meets a liquid. This clear picture of the wave enabled its synthesis. The IEMN lab built the hardware by sputtering 32 interdigitated transducers (figure 2) on a lithium niobate crystal. The electrodes are excited by an alternative current, which forces a periodic motion of the crystal by piezoelectric effect and creates surface acoustic waves. The INSP team performed an advanced calibration of the system by mapping the individual response of each transducer. The researchers then synchronized all the channels of the apparatus using the inverse filter method, finally getting the swirling surface acoustic wave. 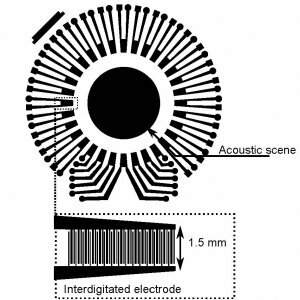 Surface acoustic waves apparatus : 32 interdigitated electrodes are arranged circularly to form a swirling surface acoustic wave on the acoustic scene. Each transducer can be addressed individually. After calibrating each transducer, the inverse filter method allows computing an optimal signal input to synthesize swirling surface acoustic waves. This experiment conducted by IEMN and INSP researchers attests of the possibility to generate tiny acoustic vortices using surface acoustic waves. 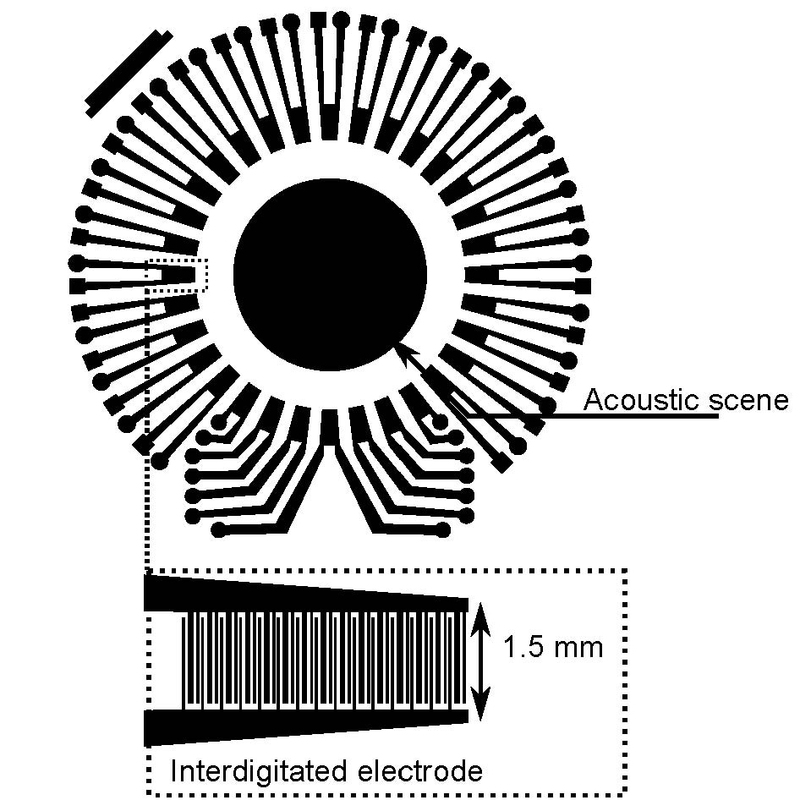 This original work offers a new pathway for the miniaturization of acoustic vortex transducers, and hopefully on a longer term of acoustic tweezers for contactless object manipulation.